Last week I received a phone call about a part time job. The man on the phone had my resume in front of him as he spoke to me and he seemed quite pleased with what he was reading. We set up a 2p.m. appointment for that day and I was certain that I was heading there to be offered a job. As I sat waiting for him, I wondered what kind of name is Ephraim. There is a St. Ephrem in the Catholic and Orthodox Church but I have never met anyone who used that name. Perhaps, Egyptian, I wondered, Coptic Orthodox? I had not been wondering for too long when I saw a bearded man wearing a yamaka. Of course, Ephraim, one of the tribes of Israel, I said. It’s very easy to forget those original worshippers of Yahweh. When my interviewer arrived, I reached out to shake his hands. I wondered if it is because I am female or a goy. But I did not dwell on that. I wanted the job and tried as quickly as possible to turn the conversation to the position to be filled. However, it seemed impossible. My interviewer, who had been enthusiastic on the phone that morning, seemed uninterested in my application. He asked a few basic questions and told me that he had to interview other people. As I stood up, he reiterated that he would not shake my hands. I said, “It’s no problem. I understands,” trying my best to placate the man who I hoped would be writing me a regular paycheck. Is my skirt too short? I wondered. Perhaps, my sleeves are too short. Is he racist? Was he not expecting me to be a black woman? Why would he imagine that only Jews would answer his ad? As I walked away I became increasingly furious as I reflected on the fact that I am the same woman whose resume he thought was perfect only a few hours ago. I could always wash my hands, but it’s harder to wash a hurt feeling.Refusing to participate in customary and morally neutral social norms is inherently rude. Shaking hands is what we do in the West. It is how we show respect. 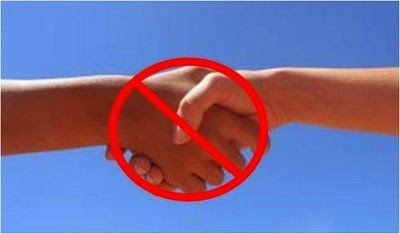 By refusing to shake my hand, he is declining to participate in a simple act of civility that lubricates our social interaction. Yet, it is even worse than that. He is refusing to touch me because his God tells him I am unclean. He can treat me as an inferior being and hide behind God the whole time. I remembered all the times that I had wanted to not shake someone’s hands, like someone who I had just seen pick his nose. But having no such option—no deity that permits rudeness to nose pickers—I yielded and shook the hand. I could always wash my hands, but it’s harder to wash a hurt feeling. But he had no such concerns about my wounded feelings. He, sat there, self-righteous and satisfied, that his God is pleased at his having insulted me. With God, all is justified. Oh, the many pages I could write on the rights that the faithful arrogate to themselves. I have had complete strangers call me on the phone to interrogate me for my atheism (He got the number from a concerned Christian friend). I have had men take me on dates and used it for missionary purposes. My own mother has wondered if I lost a tutoring client because of my apostasy and she was on the side of the Christian client. Of course, like all unbelievers, I am often told that I am destined to spend eternity suffering; that I deserve an eternity of suffering; that I have chosen it; I am told this in love, of course. These are just the minor inconveniences and insults that the people of Abraham subject us to. Yet, their imagined rights extend to graver matters. They proclaim the right to not feed those whose sexuality they find deviant. They proclaim the right to deny contraception to loose women or any women they like. They proclaim the right to indoctrinate children with mythology over scientific truth. They proclaim the right to not sit next to women on airplanes. They proclaim the right to hinder social interaction through veiled faces. And of course, they proclaim all these rights at the expense of tax payers. Within all of us they is the potential to be unkind and self-righteous, but without an imaginary friend, there is no one to excuse it. If I am rude, I have no one to hide behind. I have to face myself, knowing that I am without excuse. Moreover, I know there is actually no Jew or Gentile in or out of Christ. There is only life on Earth, which is tightly related through millions of years of evolution. This knowledge is not only the beginning of wisdom but of decency. Carolyn Hyppolite is the author of Still Small Voices: The Testimony of a Born Again Atheist.